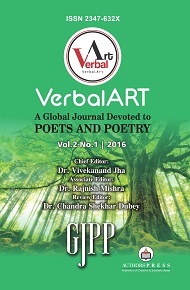 Holly Day, K. V. Raghupathi, Avdhesh S. Jha, Gale Acuff, Sandip Saha, Dhiman Saha, Aritra Basu, Sandeep Kumar Mishra, Sukrita, JW Burns, Kristine Hovsepyan, T. Ashok Chakravarthy, Bill Cotter, Roger Singer, Fabrice Poussin, Fabrice Poussin, Gary Langford, James G. Piatt, Sue Vickers Tordoff, Munia Khan, Edward Lee, Sneha Dubey, Daniel King, Yuan Yuan (Sneha), Rajiv Khandelwa, Chandra Shekhar Dubey, Dr. Sapna Dogra and Dr. P. Raja. 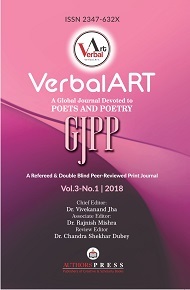 A publishing venture of Authorspress, VerbalArt is a refereed & double blind peer-reviewed print journal devoted to poets, poetry and poems lock, stock and barrel. 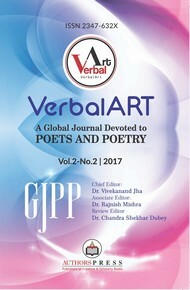 The journal publishes everything pertaining to poets and poetry and it will feature poems, reviews on books of poetry, and the interviews with established poets and the research/critical/academic articles on poets and poetry. 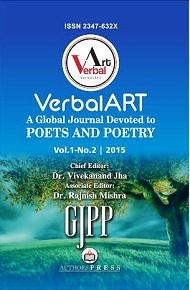 Though Phenomenal Literature is basically a bi-annual print journal yet its soft copy is also made available online to engage and attract more and more readers from all over the world. 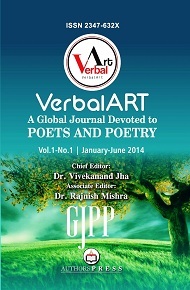 The journal is published by Authorspress, New Delhi, India.